Condensing water heaters are becoming more popular than ever. The main reason for their popularity is the extremely high energy-efficiency they offer. If you read our condensing water heater reviews, you’ll notice that they all have an energy factor of 0.94 or higher. This kind of efficiency is impossible to achieve with any other type of water heater. Therefore, you should definitely choose a condensing water heater if you want to reduce the energy waste in your home. Condensing water heaters come in various forms, shapes, and sizes. Some condensing water heaters have storage tanks just like traditional water heaters, but you can also find tankless condensing water heaters. In this guide, we have reviewed some of the best and most efficient models from both of these groups. Read on if you want to find out more. This model from Rheem belongs to their Professional Prestige Series of highly efficient tankless water heaters. Since Rheem RTGH-95DVLN is a condensing unit, it extracts heat from the exhaust gases which brings energy waste to the absolute minimum. This unit uses a two-pipe direct vent system. It also comes with a built-in electric blower. This water heater is a good solution for households and commercial properties with an extremely high demand for hot water. It’s incredibly powerful, providing up to 9.5 gallons of hot water per minute. Furthermore, this unit will work flawlessly even in the most extreme conditions. It offers a flow rate of 4.9 gallons per minute at 77 degrees F temperature rise which makes it perfect for areas with extremely cold climates. You don’t need to worry about the water freezing either since the Rheem RTGH-95DVLN comes with built-in freeze protection. High altitudes aren’t a problem either since this unit can work at altitudes up to 9,840 feet above sea level. The Rheem RTGH-95DVLN also features intelligent electronic controls and a self-diagnostic system that shows maintenance codes in case there is a problem. A digital remote control is also included for even more convenience. Finally, this unit comes with a 12-year warranty on the heat exchanger and a 5-year warranty on all other parts. When you take all of this into consideration, it’s no wonder there are so many positive Rheem water heater reviews out there! Rinnai Manufacturing was founded as far back as 1920. In 1921, they made the first tankless water heater for domestic use. They have kept coming up with new water heating solutions year after year which is why Rinnai water heaters are still quite popular. The RUR98iN model brings the latest advances in water heating technology into your home. You can install it almost anywhere thanks to the Tankless Rack System. Furthermore, this unit is not only very compact and beautifully designed but also incredibly powerful. It can provide up to 9.8 gallons of hot water per minute which makes it the most powerful tankless water heater on our list. Furthermore, the unit is equipped with two heat exchangers (the second one uses the heat from the exhaust gases to preheat the incoming water) and a built-in circulation pump. This configuration allows the Rinnai RUR98iN to be extremely energy efficient too. You don’t have to take Rinnai’s word for it – their water heaters have received the Energy Star Certification. One of the best things about this water heater is the fact that it offers multiple venting options. You can use two PVC pipes, but you can also use a concentric vent. Navien is a company with a lot of experience in producing energy-efficient water heaters. The company was founded in 1978 as Kyung Dong Machinery Co., Ltd. In 1982, they launched the first condensing water heater in Asia. Ever since then, they have been striving to create innovative, efficient, and user-friendly products. Today, their NPE-A series of condensing tankless water heaters offers some of the most advanced features on the market. The Navien NPE-240-A Tankless Gas Water Heater is perfect for mid-sized and large homes. The sleek design with white exterior allows this water heater to fit in seamlessly almost anywhere, but the awesome features of this unit go way beyond the design. First of all, Navien water heaters from the NPE-A series come with a unique recirculation system called ComfortFlow. The most common problem with tankless water heaters is the “cold water sandwich effect”. In other words, they tend to send out short bursts of hot water before the hot water starts flowing out The ComfortFlow system eliminates this problem by adding an insulated buffer tank to the heater. As a result, you won’t need to wait for the hot water to start flowing which means you’ll be using less energy and less water. Furthermore, this water heater from Navien offers unmatched flexibility since it can be used either with natural gas or with liquid propane. Finally, the digital screen makes adjusting the settings easier than ever. This is definitely one of the best condensing water heaters you can find for the price! 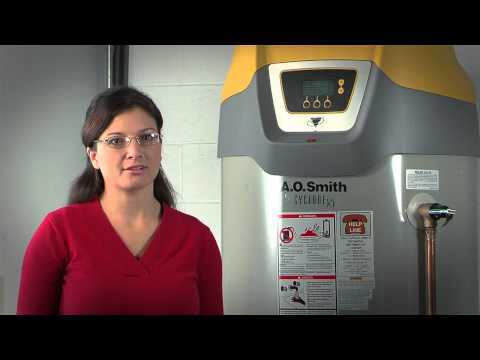 If you have read any of the AO Smith water heater reviews, you probably already know that they are very popular. In fact, AO Smith is one of the leading manufacturers of tank-type condensing water heaters. AO Smith GDHE-50-NG Residential Natural Gas Water Heater features a 50-gallon tank. A heat exchanger with 100,000 BTU input runs through the inside of the tank. Since it is so powerful, this heat exchanger allows the unit to provide a constant flow of hot water. At maximum capacity, it can provide an output of 4 gallons of hot water per minute. Additionally, the spiral design of the heat exchanger allows it to keep the combustion gases in the tank longer which results in longer heat transfer time. With this unit, you can have endless hot showers and never run out of hot water! This water heater also features a unique direct vent design. You can use either PVC, CPVC, or polypropylene pipes for venting. The unit also comes with a large LCD display which allows you to control the temperature precisely. The patented Blue Diamond glass coating protects the tank from corrosion. Finally, the AO Smith GDHE-50-NG water heater comes with a 6-year limited warranty on all parts. The American Standard D-100-199-AS Commercial Natural Gas Water Heater is a powerful unit with a heavy-gauge steel tank. The capacity of the tank is 100 gallons. It is a very durable unit equipped with all the necessary features. The tank is lined with patented Dura-Glas lining to prevent corrosion. The water heater also includes four anode rods that extend the life of the tank and serve as additional protection from corrosion. Furthermore, the tank is covered by an insulation layer that maximizes heat retention and reduces energy waste. The American Standard D-100-199-AS Commercial Natural Gas Water Heater is an excellent choice for areas with hard water since it comes with a self-cleaning cold water inlet tube that prevents the formation of sediment deposits. The unit comes with a 3-year warranty on the tank and a 1-year warranty on all other parts. How Does a Condensing Water Heater Work? When gas burns in a water heater, it creates vapor as a byproduct. When the vapor cools down, it condenses on a surface. That is where the “condensing” part of “condensing water heater” comes from. While non-condensing water heaters vent these byproducts, condensing water heaters recycle the heat that comes from the vapor. They usually feature two heat exchangers instead of one. The second heat exchanger captures the heat energy from gas vapors and uses it to preheat the incoming water. What are the Benefits of Condensing Water Heaters? The most important advantage of condensing water heaters is the fact that they save energy and money. Since they use less energy, these water heaters also produce lower greenhouse gas emissions. For this reason, they are better for the environment than any other type of water heater. Why Should I Invest in a Condensing Water Heater? Condensing water heaters are more expensive than some other types of water heaters. However, if you switch to a condensing water heater your energy bills will become considerably lower. Therefore, you’ll actually save money in the long run despite the higher initial investment. Which water heater you choose will ultimately depend on your specific needs. However, our favorite is definitely the Rheem RTGH-95DVLN Natural Gas Tankless Water Heater. The unit is quite compact and lightweight. Furthermore, it works perfectly even in cold climate, and it provides a flow rate of 9.5 GPM which is extremely high. What more could you ask for from a water-heating unit? Whatever you choose, we hope our condensing water heater reviews have helped you make the right choice.